With the introduction of the Raynor Eurotech iOO Chair into your workspace, you really can have it all: sleek, modern design, and the utmost in ergonomics at an affordable price point. Supremely height-adjustable with the control of a single lever, this durable chair will keep you working comfortably through all of your tasks. The padded seat cushion cradles your lower half while lumbar-supporting mesh back gives you improved breathability, all in a single seat. 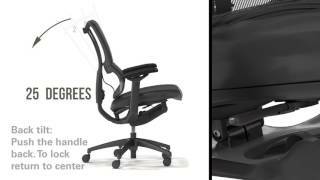 The Eurotech iOO Chair from Raynor also features 3D dynamic lumbar support, which moves with you as you work, while still providing the best in back buttressing. Able to seat a variety of people and body types, this is an ideal chair to add to your multiple user workstation for more comfortable work when you need it. The Raynor Eurotech iOO Chair can be ordered in either a black or white frame. Both configurations would come with black mesh. $672.00 List Price: $1,176.00* The list price is the same as the MSRP (Manufacturer's Suggested Retail Price). It may not necessarily be the price at which the product is sold.